Channel4 News’s estimable Jon Snow on the psychogeographic-significance of the G20 summit being held in the Excel centre in London’s Docklands. “Even in the best of times, this is a dump, a warehouse in which absurdly large events are staged. Devoid of character, nestling the City airport, it is stuck in the middle of a place that appears never to have seen a shop, never to have seen a pint pulled, never to have seen a baby born, let alone a body buried. It is the waste tip of east London. And presumably now that the Olympic site has been cleared, basks alone as a gateway to nowhere. Waking up, waking up has never been easy. 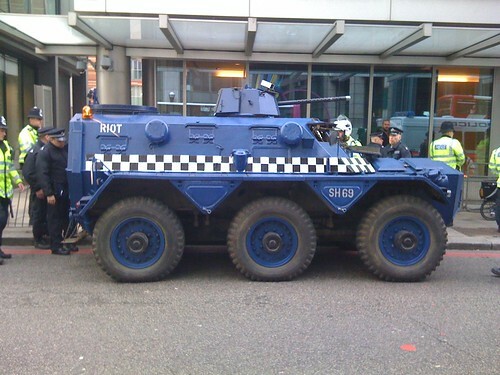 What Anarchists Drive, originally uploaded by Ben Terrett. “The sequence of events in the successfully waking world was generally more or less as follows. The starting point, it will be remembered, was a plight like that in which our own Earth now stands. The dialectic of the world’s history had confronted the race with a problem with which the traditional mentality could never cope. The world-situation had grown too complex for lowly intelligences, and it demanded a degree of individual integrity in leaders and in led, such as was as yet possible only to a few minds. Consciousness had already been violently awakened out of the primitive trance into a state of excruciating individualism, of poignant but pitifully restricted self-awareness. And individualism, together with the traditional tribal spirit, now threatened to wreck the world. Only after a long-drawn agony of economic distress and maniac warfare, haunted by an increasingly clear vision of a happier world, could the second stage of waking be achieved. In most cases it was not achieved. “Human nature,” or its equivalent in the many worlds, could not change itself; and the environment could not remake it. But in a few worlds the spirit reacted to its desperate plight with a miracle. Or, if the reader prefers, the environment miraculously refashioned the spirit. There occurred a widespread and almost sudden waking into a new lucidity of consciousness and a new integrity of will. – Olaf Stapledon, Starmaker, Chapter Nine. On the (27 hour) plane ride back from New Zealand, I watched a lot of movies, some unremarkable – some wonderful. Watching Happy-Go-Lucky was painful for some reasons, and beautiful for others – but it definately hit me with the pink laserbeam between the eyes. Watching classics like The Apartment and Manhattan made me wonder at the romances we’d write about some cities, and Slumdog Millionaire bizarrely seemed like a continuation of that: a romance of the maximum-city. But, beside that – everytime a movie finished, the entertainment system reset to it’s main menu, with one of those airline entertainment system pseudo-radio stations playing on a loop. And I hit the same point in the loop everytime. And at that point in the loop played the same song everytime. The song was a romance of the city. A romance of electricity and colour and life and density of opportunity. The song was “Stepping Out” by Joe Jackson. In recent months I’ve definitely fallen into a Collapsitarian rut of sorts. The wave of stuff coming down the lightcone is for sure a Danmaku-like bullet-curtain of environmental, societal and technical challenges, but I like Danmaku! That’s where the action is, where the flow is felt, and where design wrangling of the sweetest kind can be done. So, more wrangling, less hand-wringing. Big bets should be made. It took at 27 hour flight to realise that 27 years ago in 1982, Joe Jackson knew this and planted a time capsule into culture to help me with 2009. That’s some foresight, right there. So if you are feeling a little collapsitarian, try stepping out. 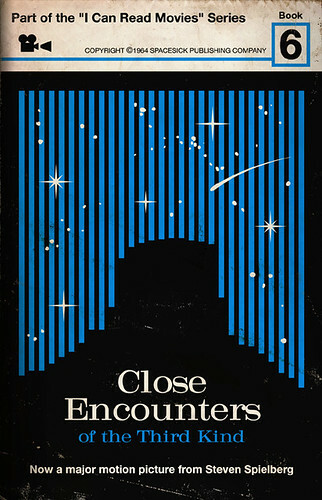 Close Encounters of the Third Kind was being shown on TV this weekend. I happened across it accidently, and sat glued to it for a couple of hours, realising perhaps how burnt into my subconcious some of the images in it are for me. I started watching it not for the story (of which there is not much, admittedly) but trying to watch the imagery, the iconography. I’m currently reading Ken Holling’s excellent “Welcome To Mars”, in which the golden age of flying saucer culture is juxtaposed with the rise of suburbia and the military-industrial-entertainment complex. One could conside Close Encounters as the end of that trajectory – and the end of other trajectories: the last freak-out LSD scifi, the last ‘serious’ 70’s scifi before/during the starwarsification of the scifi movie. And the beginning of trajectories: the scifi conspiracy movie, the beginning of the industrial light-and-magic revolution, and an in-joke that would play out more than 25 years later in Alias. Aside from being lost in the imagery, one piece of dialog I had never heard before floated through as soon as I’d switched on. It’s the scene where a young boy, Barry is about to be abducted. His mother tries to block all the doors, windows and ducts but cannot stop screws being unscrewed and their hiding place being unwrapped by light, noise and apparent unseen malevolence. 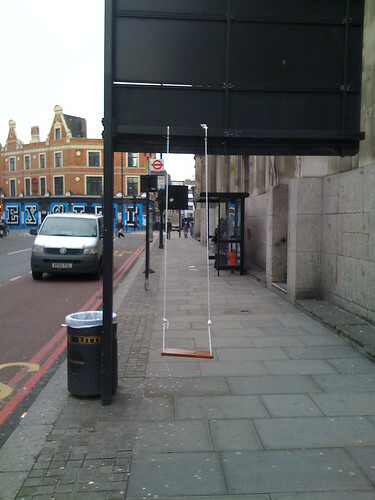 Above the pavement, the swing. Swing, originally uploaded by Matt Biddulph.